There are some days that just have to be “cheat days.” If you’re an avid viewer of “Kiana’s Flex Appeal” ESPN, you know that I use the “cheat day” method: I eat very clean 6 days per week and 1 day per week I enjoy the not-so-clean foods – in moderation. Cheat days are the days you enjoy food. Fire Fighter Recipe. Can’t over cook it. Great for parties. Fool proof. On Super Bowl, this is the day that you get to eat in moderation, what you want. Since my husband is a Fire Chief in the Fire Dept. it usually means a zillion guys are over eating and male bonding. This recipe should actually a called a Not So Fit Dad recipe. There are many benefits of having a Fire Fighter hubby, one being the (ahem) “uniform,” and the other is that 99.9% of them are great cooks. All the Firemen have to take turns cooking. You can imaging how they blast each other if the food isn’t good, so they learn fast. Since they never know when the fire alarm will go off, they have a huge resource of recipes that can withstand prolonged heating, extra time in the oven and still turn out amazing. If you think about it, those same qualities are great for any Recipe. Enjoy this one! I don’t usually care for ribs, but these are amazing. 1 liter orange soda – yikes! yes, you heard right. I thought the same thing. No, it’s not a typo. Fill large pot with the orange soda, orange slices and ribs. add enough water to cover. boil 1.5 hours. drain. remove oranges. cover with your favorite low sugar barbecue sauce. bake 350 degrees 1 hour. uncovered. Meat falls off the bone, so tender, tasty, lick your fingers good. Yum. Hmmm.. Wonder what the guys (Marcus Allen, Bob, Pete) are up to these days? The 2 years I cheered: Marcus Allen, Howie Long were playing. Marcus and OJ (eek) used to visit me in their new sports car of the week. One week , Marcus showed up in an amazing Ferrari, all blacked out that looked like an airplane cockpit inside. So amazing. There are 48 cheerleaders on the squad. That year, they picked 10 of us to go with the team to cheer for the American Football League in Japan at Yokohama Stadium and at Wimbley Stadium in England. We had such a fun time! The Team, Girls and I ate dinner at the US Ambassadors home for dinner and performed, shopped and did site seeing. Attended Howie Long’s induction into the NFL Hall of Fame. So exciting for him! Pingback: Kiana’s® SuperBowl Week Home Gym Workout™ Be Faster, Stronger, More Powerful | Kiana Tom - Host of the #1 Rated Fitness Show "Kiana's Flex Appeal"
Pingback: Having a Super Bowl Party? 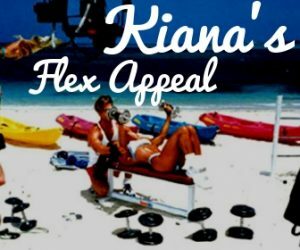 Here is what I’m making: Kiana’s® 5 Super Bowl Recipe & Snacks | Kiana Tom - Host of the #1 Rated Fitness Show "Kiana's Flex Appeal"